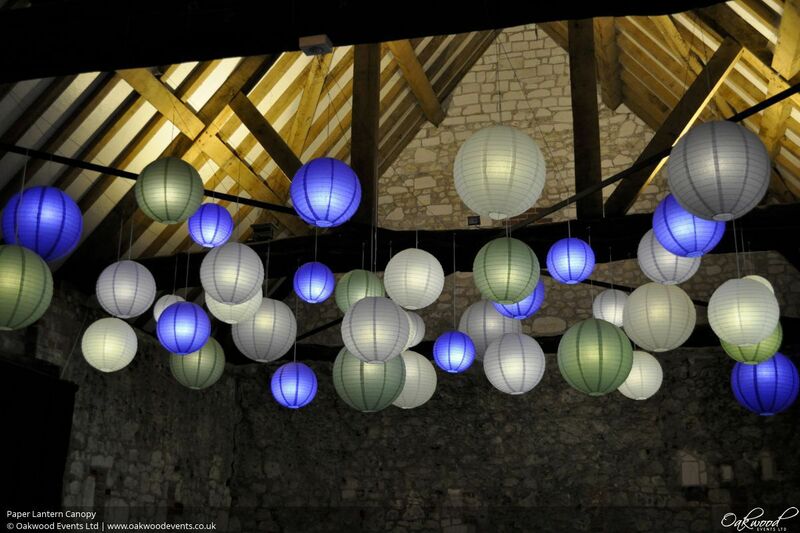 Paper lanterns are a wonderful way to personalise your wedding venue, bringing in light, colour and style. 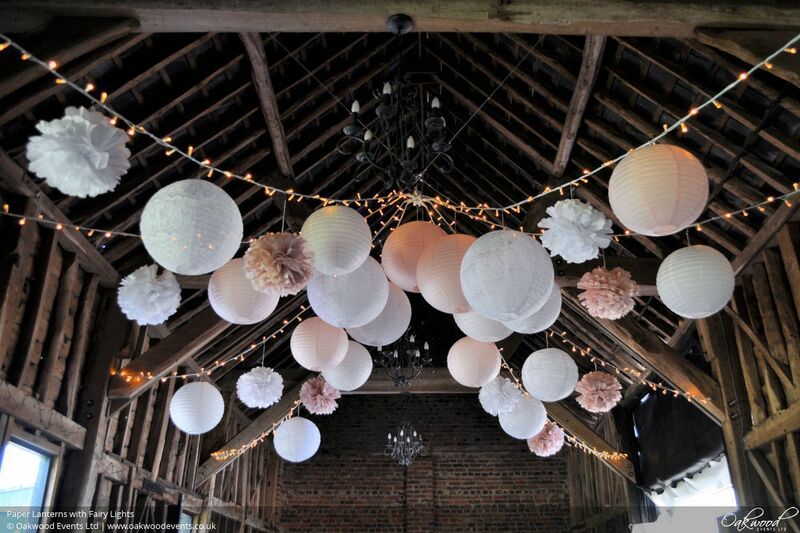 Used in conjunction with pom poms and honeycomb balls they can be used lit or unlit for relaxed country or vintage chic. 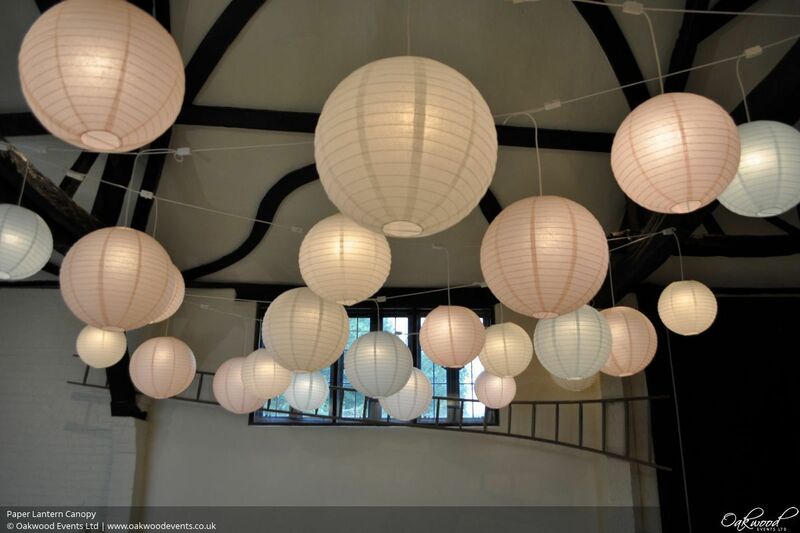 Lanterns can be used to accentuate ceilings, define dancefloors or bring colour in clusters and work in monochrome or a mixture of shades. 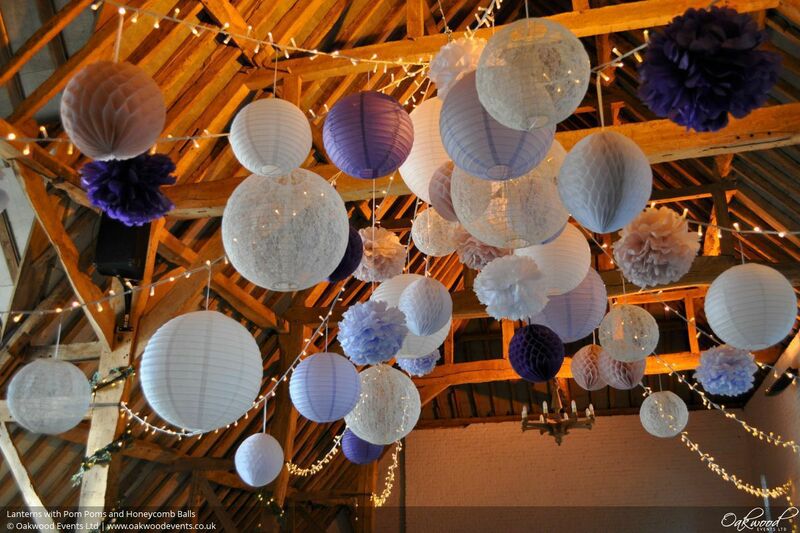 We supply lantern displays for weddings and events including all equipment hire, installation and removal. 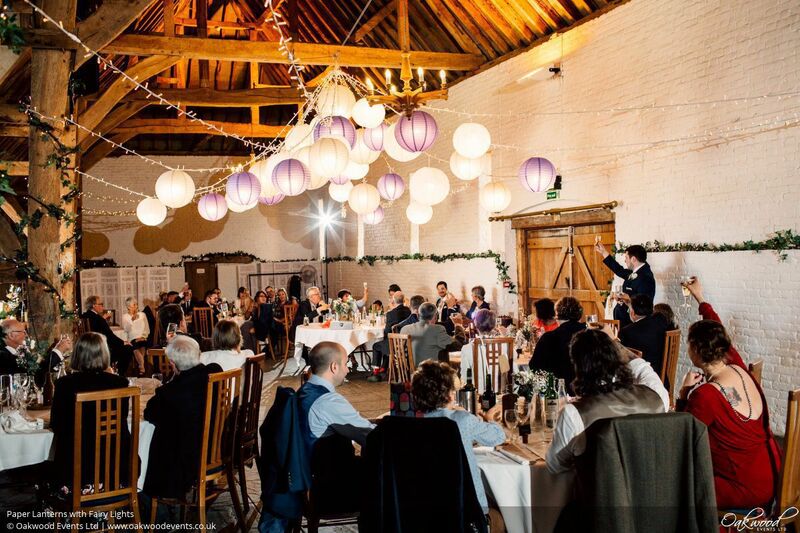 Our lanterns come in a wide variety of colours and we also have some very special lace lanterns, pom poms, honeycomb balls, paper umbrellas and some spectacular lighting options. 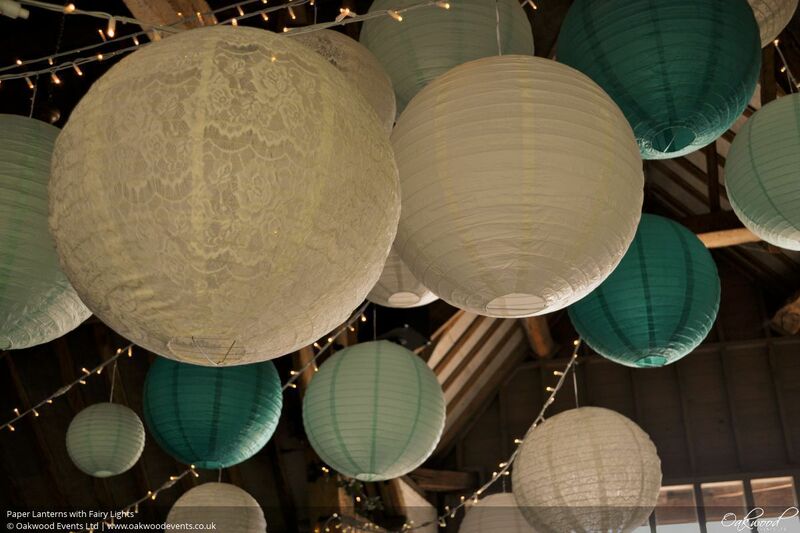 To help put together your perfect colour scheme, see our paper lantern colour chart. Lanterns are as versatile as they are useful, providing flattering, diffused lighting while introducing creative opportunities through the use of colour, texture and variation. Which design to choose will depend on the style of the event, the venue's existing features, and the available fixing points. Some of the most popular designs are described below. A beautiful display of lit lanterns suspended overhead makes an impressive feature and provides soft lighting throughout the space. Canopies can be installed in several different ways to create a structured, modern feel or a more informal look. 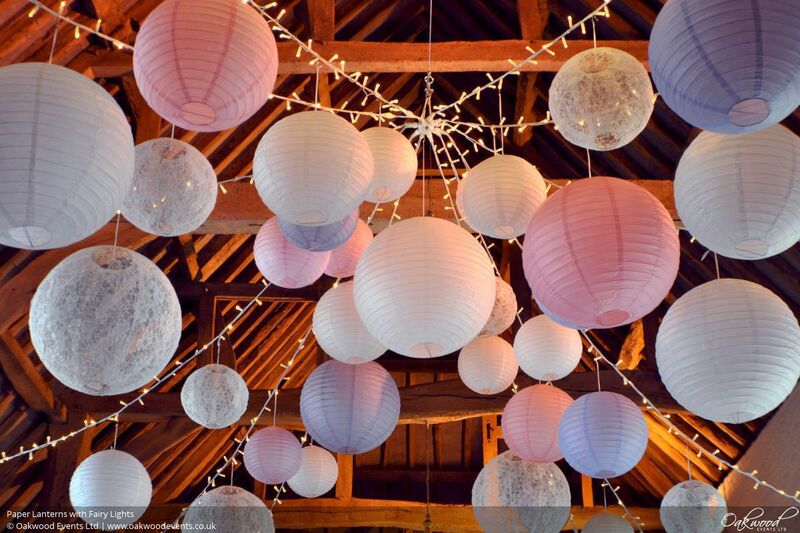 Lanterns can be suspended from a canopy of fairy lights to add colour and texture, where the lights also shine through to illuminate the lanterns. 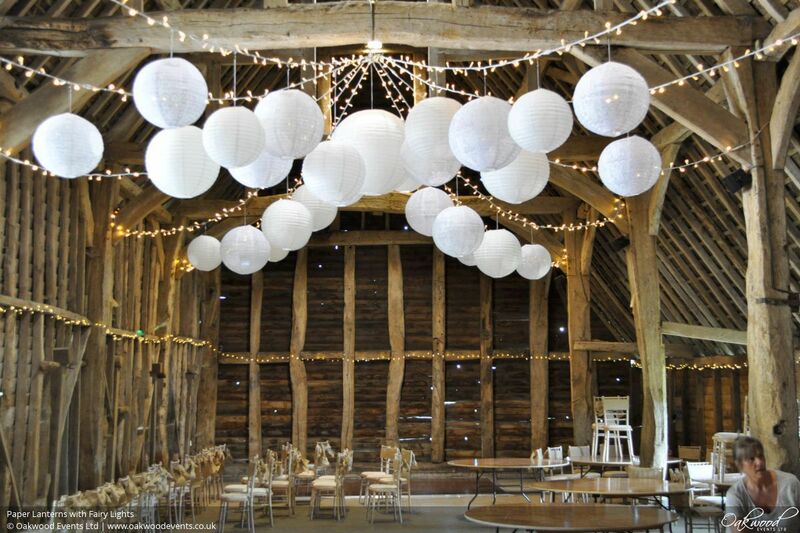 This design works particularly well with fairy light canopies that gather up to one or more high points, for example a star canopy where the lanterns can be fitted into the higher central area of the canopy. 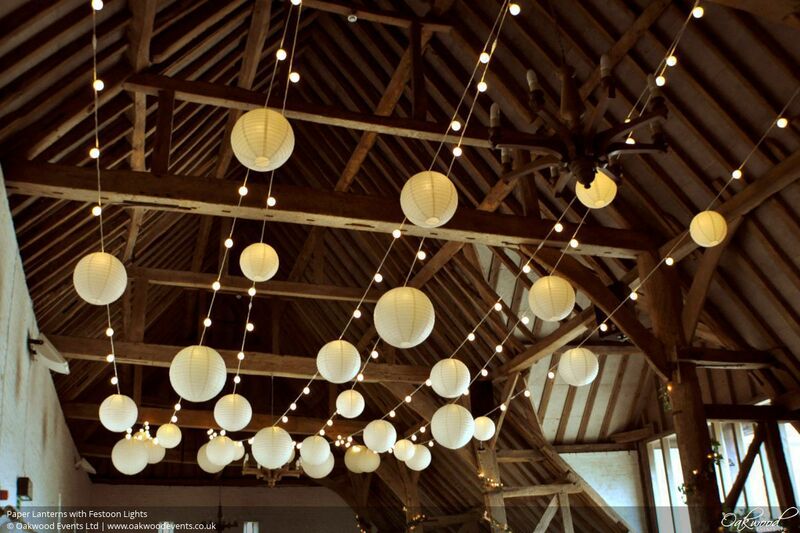 Another option would be to add lanterns distributed around a fairy light canopy such as a crossed-strands design. 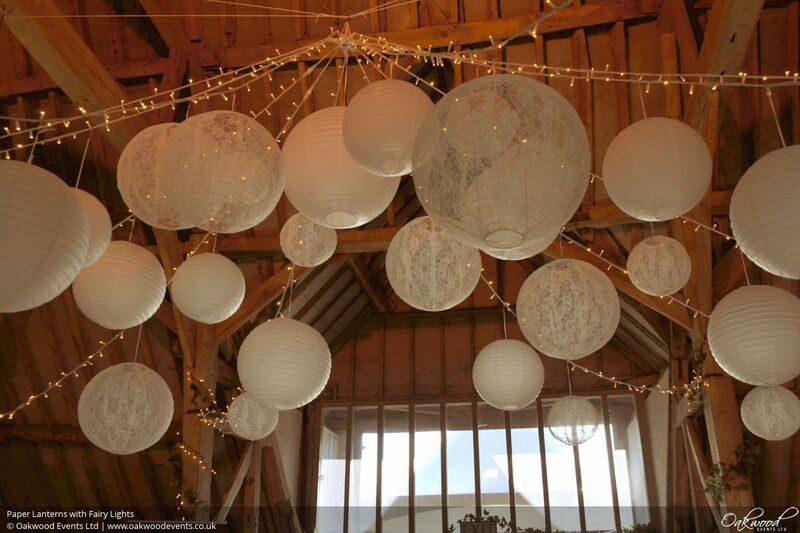 For more details on fairy light designs, see our fairy lights page. 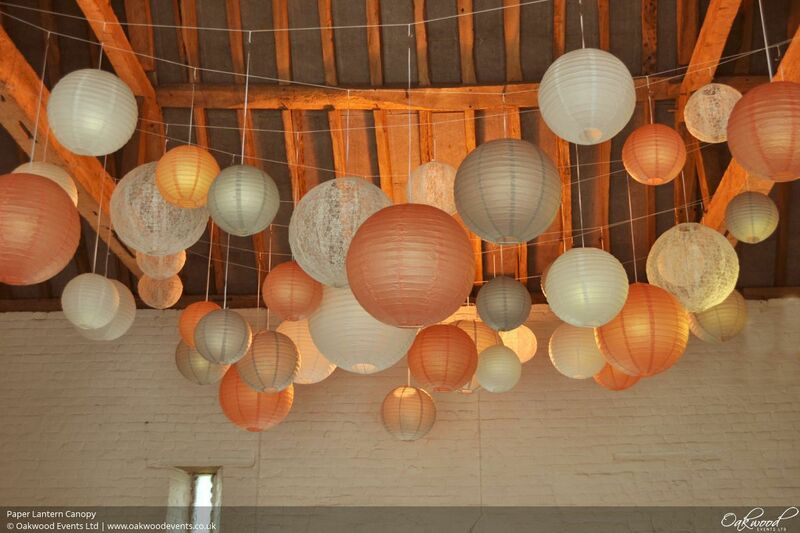 With their large bulbs, festoon lights work wonderfully with paper lanterns. 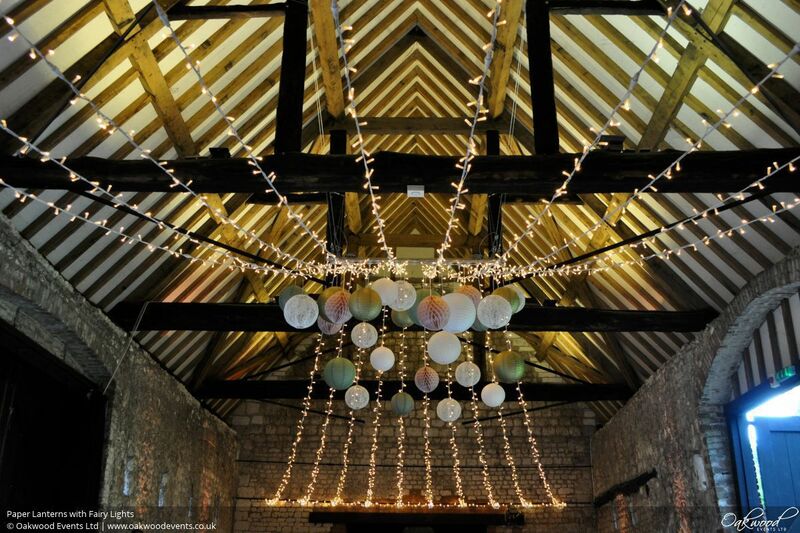 Lanterns can be distributed around a festoon canopy by adding them to selected bulbs. The light from the bulb also lights the lantern from the inside giving each one a gentle glow. 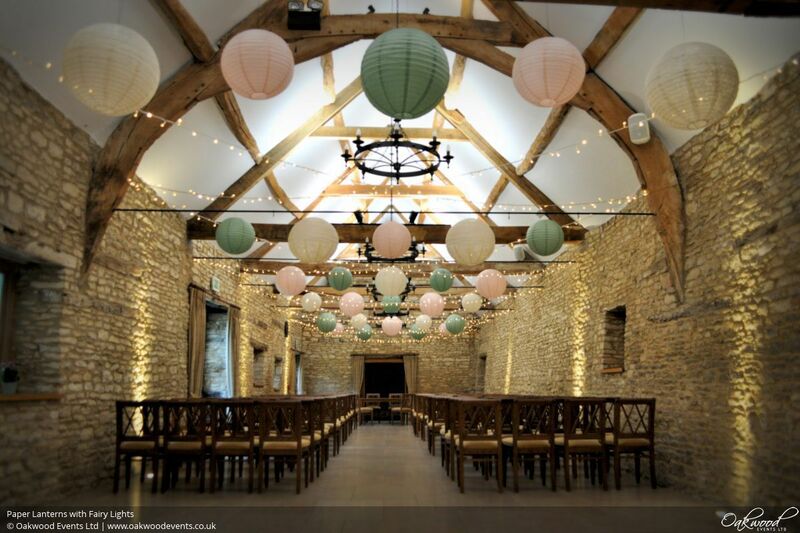 As long as the ceiling height allows, most overhead festoon canopy designs can have lanterns added, with crossed strands being one of the most popular choices as it offers a good balance of installation efficiency, impact and an even distribution of lights and lanterns. 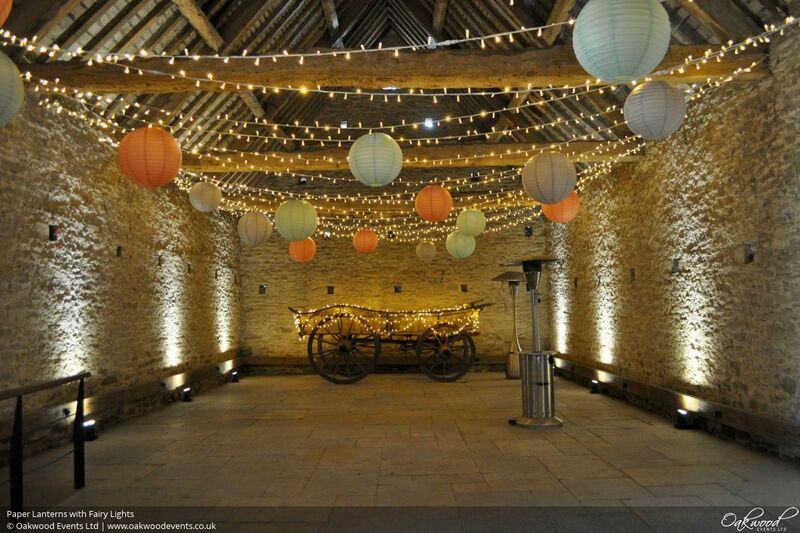 For more details on festoon light designs, see our festoon lights page. 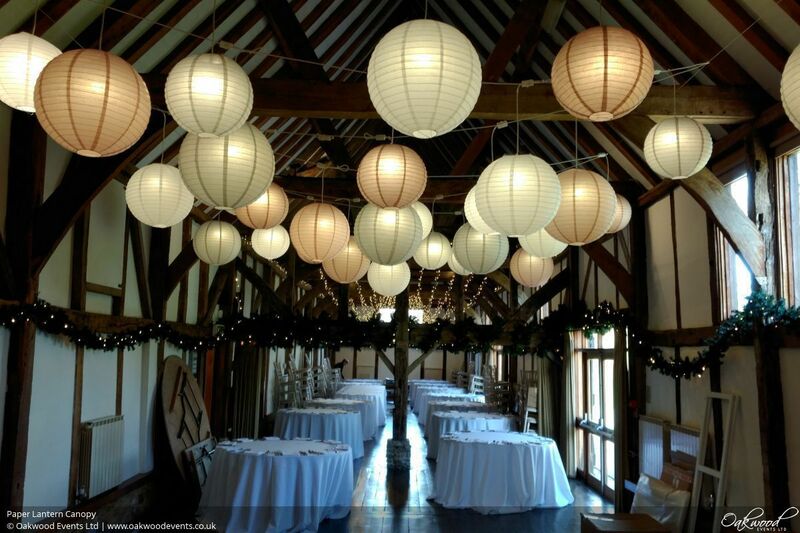 Unlit lanterns are pretty on their own, and if they're attached to fairy or festoon lights then there's often no need to light them individually. 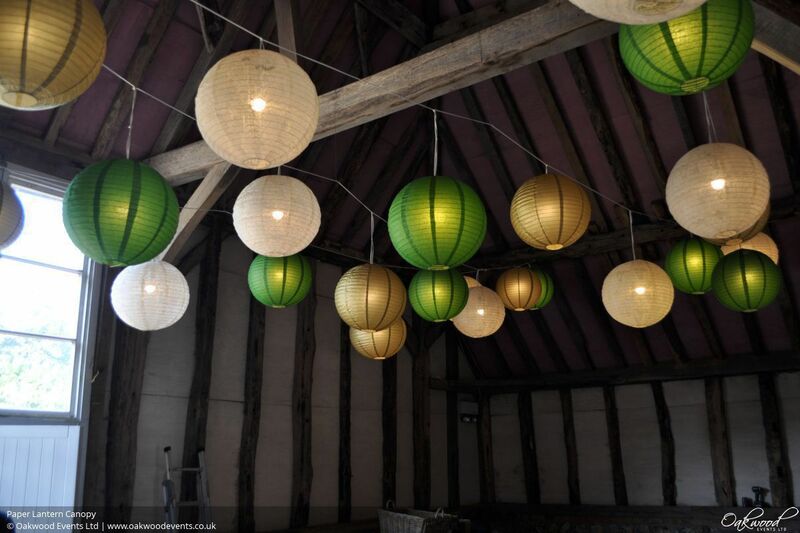 However with a lantern-only design, lighting each one from the inside really makes them stand out, colours pop, and turns a canopy of lanterns into a real statement piece. For the best flexibility we can install lanterns with dimmable mains-powered bulbs, or where running power isn't an option we have bright battery-powered lights which will last all day. For the ultimate day-to-night transformation, take a look at our disco lanterns, which are lit as normal in the day but have the added feature of synchronised colour changing after dark. 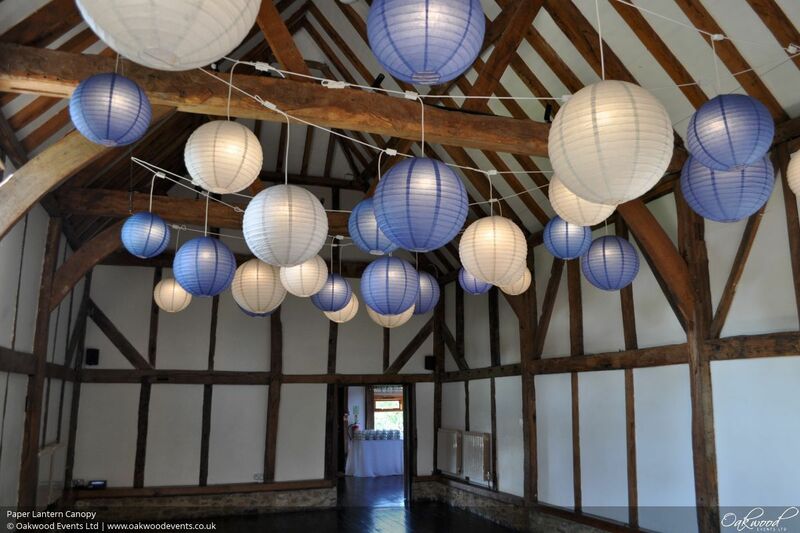 For added texture we can also add pom poms or paper honeycomb balls to lantern designs, both of which are available in a vast range of colours. As an alternative, we also have paper umbrellas which can be used in place of lanterns in some designs to form an amazing display. 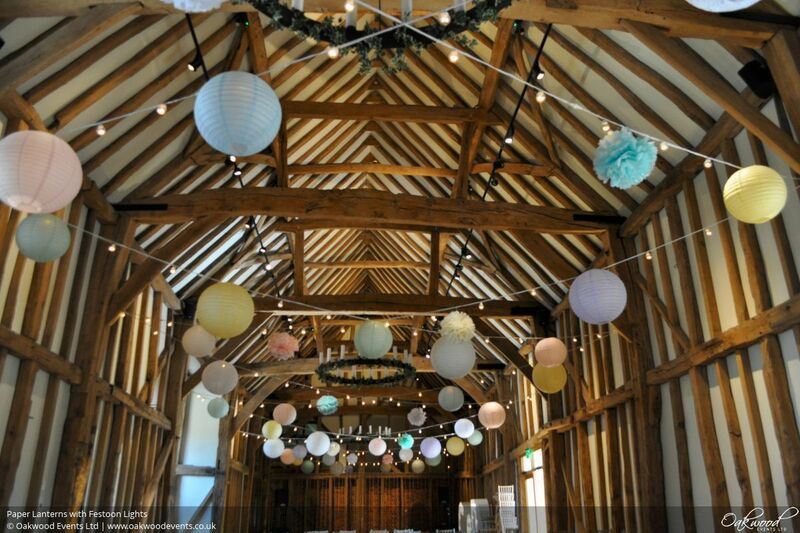 We always respect the places we work and use temporary, non-damaging fixings to hang our lantern displays. We take care to consider power requirements and aethestics, minimising visible cabling. We hold PLI, PAT, electrical safety and working at height certification but more importantly we have a rigorous attitude to safety. All of our ladders, scaffold towers and specialist equipment are well maintained and the breadth of our experience means that we are preferred suppliers in the most prestigious venues who value safe, reliable and efficient installations. We are experienced in providing large on-the-day installations under time pressure and packing down with the minimum of fuss. For lots more images of our lantern work, see our paper lantern Pinterest board. 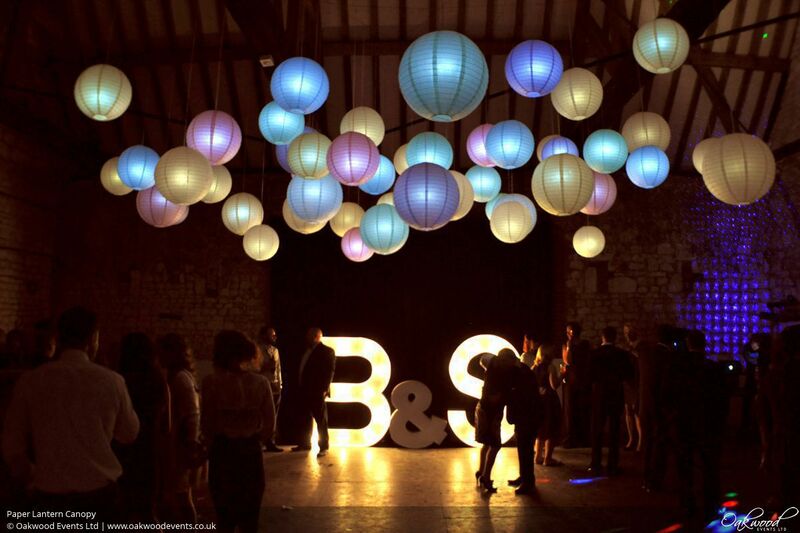 To discuss lighting ideas for your event, contact us here. 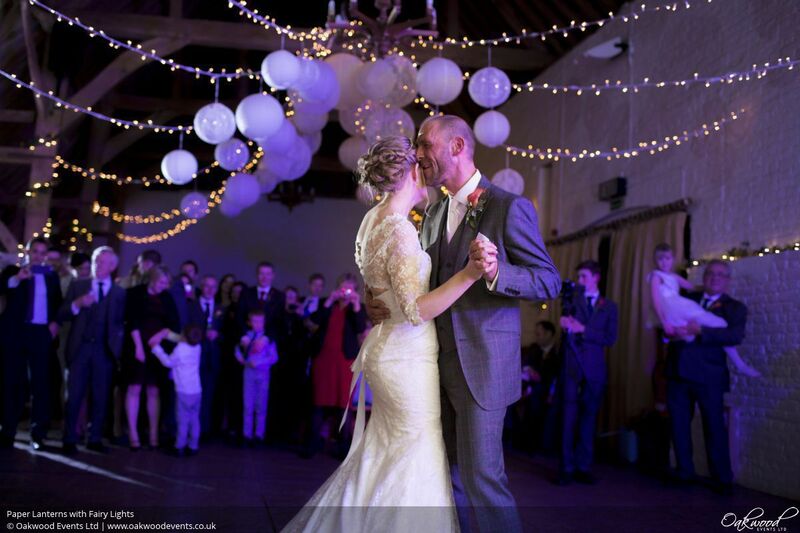 I just wanted to say again how pleased we were with the lanterns (and the different colour effects!) 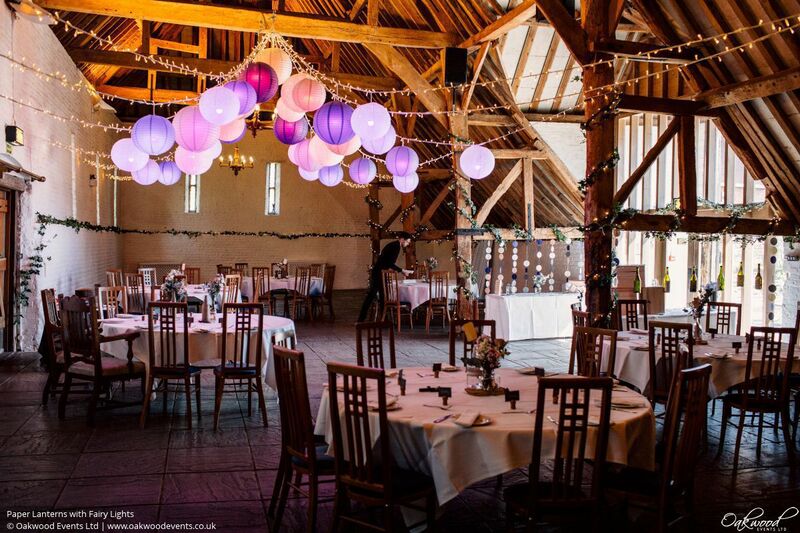 - they really did transform the barn into a party venue and Jess (the birthday girl) was so pleased with everything. We will definitely be contacting you again for parties in the future and recommending your services!